"A few words are in order about the actual contents of each Domain Sourcebook. We'll start with the cover. • A full-color, eight-page foldout cover containing detailed maps of the domain and important locations within it. • Facts about the history, geography, and economy of Roesone. • A summary of how the government works, and the resources the regent can use to maintain control of the realm. • Descriptions of the major NPCs in Roesone, friend and foe alike. • Rumors to keep the regent on the alert, and royal secrets to help keep enemies at bay. 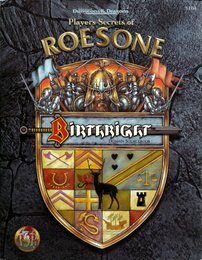 This Birthright domain sourcebook is designed for players who want to take the role of Baron Roesone, the warrior regent of the land. It may also be used by players playing nobles, servants to the Baron, or adventurers of Roesone." "Welcome to Endier, one of the smallest domains in Anuire. Carved from the treacherous forest known as Spiderfell, it is precariously balanced between three of the more powerful realms of the land, playing a delicate game of politics and diplomacy to survive. One misstep could mean its ruin; the fate of the land rests squarely on the shoulders of you, its regent. It is said that with great risks come great rewards. If this is so, then the rewards of ruling Endier must be great indeed." • Facts about the history, geography, and economy of Endier. • A summary of how the government works, and how the regent manages to keep control of it. • Descriptions of the major NPCs in Endier, friend and foe alike. 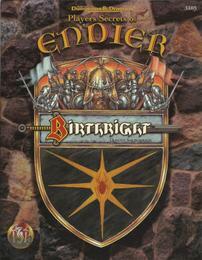 This Birthright domain sourcebook is designed for players who wan to take the role of the Lord of Endier, the thief regent of the realm. It may also be used by players playing nobles, servants to the regent, or adventurers of Endier." "Ranging from the Spiderfell in the north to the Straits of Aerele in the south, Medoere was born of faith and the blood of revolution. As regent, you fulfill the duties of Archpriest of the Church of the Celestial Spell, leading the theocracy to greater heights of glory. The domain is yours to command - if you have the courage, the conviction, and the blood of kings in your veins." • A full-color, eight-page foldout cover containing detailed maps of the domain and other information every Medoerean needs to know. 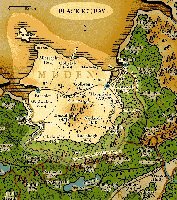 • Facts about the history, geography, and economy of Medoere. • An overview of Medoerean society and law. • Descriptions of the major NPCs in Medoere, friend and enemy alike. • Rumors, secrets, and strategy tips to help the new regent keep control of the realm. This Birthright domain sourcebook is designed for players who want to take the role of Archpriest. It may also be used by players playing vassals to the regent, or adventurers who want to explore the mysteries of the theocracy." "Take the throne of Tuornen, rules its proud people, and reap the rewards of its rich lands. But beware, for Tuornen faces threats from many quarters. The scheming Duke of Alamie wants to regain control over the rebellious domain that broke from his grandfather's archduchy - your domain. Your hotheaded lieutenant wants to wage a war Tuornen cannot win. Two powerful regents of neighboring domains want your loyalty for their own ...and Rhuobhe Manslayer wants your head on a pike." • A full-color, eight-page foldout cover containing maps of the domain and its holdings. • The history of Tuornen and its war of independence from Alamie. • Details about political, social, and cultural life. • Descriptions of Commander Braedonnal "Firebrand" Tuare, Mad Maeve, Baubb the Toymaker, and other colorful personages. • Rumors, secrets, and plots against you. • Strategy tips for governing Tuornen wise and well. 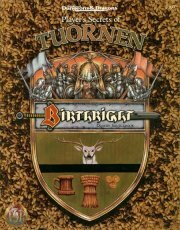 This Birthright domain sourcebook is designed for players who want to run a fighter of rogue character in the role of the duke - or play a vassal who controls holdings within Tuornen, a noble of the court, an itinerant adventurer, or a commoner." "The benevolent wizard Count Aglondier of Ilien is dead! He has left control of his realm to you, his trusted apprentice. With the considerable power of realm magic behind you, your task is to govern Ilien and defend it from those who wish to conquer your small domain." • A full-color, eight-page foldout cover containing maps of the domain and important locales. • The history of Ilien, from its origin steeped in magic to the recent suspicious death of Count Aglondier. 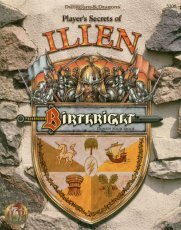 • Information on the Free City of Ilien, the second largest city in all of Anuire. • Major NPCs of the land: el-Hadid the dangerous guildlord, Alliene Tilgentor the staunch ally, and others. • Rumors, secrets, and plots that help and hinder the new regent. 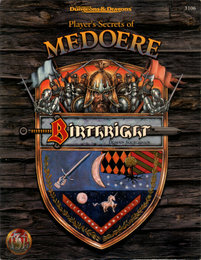 This Birthright domain sourcebook is designed for players who want to take the role of the wizard king, or play a guild leader, a lieutenant, or a servant to the king." "To the casual observer, the realm of Talinie seems a pastoral place full of hard-working, law-abiding citizens. But those who look beneath the surface -- as a regent must -- will see what lies beneath the beauty. From the south, a power-hungry archduke has moved troops into two of Talinie's seven provinces, supposedly as a safeguard against goblin invasion. From the north, greedy guildmasters have encroached upon Talinie's lush forests and have ravaged large areas for the timber and ores they yield. To keep yourself on the throne known as the Oak Seat, you must control these foreign interests without giving them reason to rise up against you, and at the same time beware of traitors within your own court -- it is whispered that the death of your predecessor was not really an accident." • A full-color, eight page foldout cover containing detailed maps of the domain and other information every Talinien needs. • Facts about the realm's history, geography, economy, and laws. • Descriptions of the major NPCs in Talinie, friend and foe alike. • Secrets and strategy tips to help the new regent manage the realm. This Birthright domain sourcebook is designed for players who want to take the role of Thane of the realm, playing either a lawful priest or a paladin. 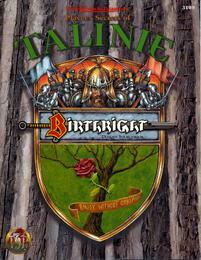 Players of nonregent characters who live in or come from Talinie will also find this sourcebook useful." "On the shore of the Sea of the Golden Sun lies Ariya, the oldest city in all Cerilia. The City of Temples and its surrounding provinces form the jewel of Khinasi history, learning, and culture. From this land of ancient magic emerged the Great King el-Arrasi, who brought glory to Ariya seven centuries ago. Now Ariya's citizens turn to you, their newly crowned lord-prince, to restore the city-state to its former eminence. Tested by war-hungry neighbors, relgious zealots, and a shrinking treasury, Ariya's ruler must champion light and reason if he is to guide the realm into a new Golden Age. • A full-color, eight-page foldout cover containing detailed maps of the state and its holdings. • The story of Ariya's pivotal role in Cerilian history. • Facts about the state's geography, holdings, and economics. • Information about the Khinasi people, lands, and culture that supplements the Atlas of Cerilia in the Birthright boxed set. • Descriptions of important Ariyan citizens. • Secrets and strategy tips to help the new prince keep his seat on the Thousand Jewel Throne. 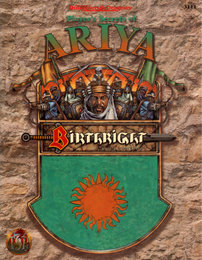 This sourcebook is designed for players who want to take the role of Ariya's regent - a paladin or lawful good priest. Players of nonregent characters who live in or come from Ariya will also find this book useful." "The many-headed Hydra slithers in the Harrowmarsh on your western border. The Sphinx prowls its blasted lands, breathing a venomous wind upon the lush savannah. The Harpy's birds of prey circle in coastal salt breezes, raiding laden ships. It seems as if Binsada, your land of simple, nomadic cattle herders, is hemmed in by monstrous enemies on all sides. Binsada is a realm where honor means more than wealth. The ruler of this domain must maintain the status of the royal family while not offending those from other highly placed lineages. Foremost in the regent's thoughts must be retaining the loyalty of her first lieutenant, Vorduine, and controlling the ambitions of her cousin, Prince Daoud - without his knowledge, of course. This regent must have a cunning mind, a flair for the dramatic, and an honorable heart. 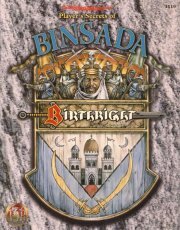 This Birthright domain sourcebook is designed for players who wish to take the role of the queen of Binsada. It may also be used by players portraying nobles, vassals of the regent, or adventurers from this domain." "Long before humans invaded Cerilia, the dwarves of the land had carved out a peaceful life for themselves, marred only by the persistent savagery of orog tribes. Since the human incursion, life has changed little for the natives of Baruk-Azhik, sequestered safely beneath the inhospitable mountains known as the Iron Peaks. Baruk-Azhik is a domain of untold riches; there seems to be no end to the precious metals under the mountains, and surface-dwellers are always eager to trade. But the domain is not without perils. The orogs have grown more numerous and more cunning, and outside help may be needed to defeat them once and for all. The character who ascends the throne of Baruk-Azhik assumes command of a mighty and loyal nation - but one whose existence hangs in the balance. Only a leader with nerves of steel, harded determination, and superior command skill can guide the dwarves into a future full of promise and free of war. 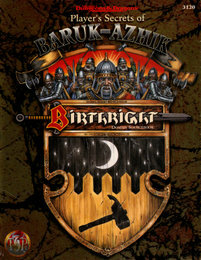 This Birthright domain sourcebook is designed for players who wish to take the role of the Overthane of Baruk-Azhik. It may also be used by players playing nobles, vassals of the regent, or adventurers from this domain." "From the fishing villages of Fing Zjulor to the druidic city of Odemark and the great capital of Skapa Hjarring, this is Halskapa, the greatest kingdom of the Rjurik Highlands in the Birthright campaign setting. King Bervinig, aged and ailing, a man who once united the discordant provinces of Halskapa, is abdicating his throne in favor of your character. Once, he could take almost any action and keep the support of the jarls who govern these provinces. Now, his mind debilitated and his strength ebbing, anything he does creates open conflict with them - and they are particularly outraged that he has designated someone from outside the group as his successor. Will the ambitious, competitive jarls allow the crown's choice to stand? Will they allow the new regent to live? Halskapa, the original settlement of the Rjurik in the Highlands, with a long and proud history as a bulwark of human civilization in the north, is about to plunge into civil war - unless you can tame the jarls, stop the internal feuds, and prevent invasion by those who view the regent as weak and Halskapa as prey. 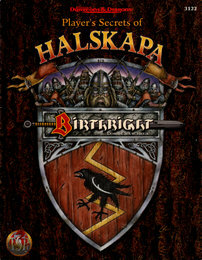 This Birthright domain sourcebook is designed for players who wish to take the role of the High Jarl of Halskapa. It can also be used by players taking the roles of provincial jarls, vassals of the regent, merchants, or adventurers in this Norselike domain." "Khourane stands out among the arid Khinasi lands like a blooming lily in a barren field. It boasts some of the most enviable territory in this corner of the world: mountains, deep jungles, and a stunning coastline. These enivable feature inevitably lead to conflict, however: The lands are coveted by the Serpent, the Magician, and the Minotaur. What's more, the elves still resent the humans who claim control of the hereditary forests. Combine these problems with fierce trade wars, a harsh climate, and a missing ruler, and the result is trouble. Khourane needs a new regent in a hurry - is your character ready to face the challenges? The new ruler of this domain will be challenged by some of the greatest problems - and could realize some of the finest rewards - in all of Cerilia! 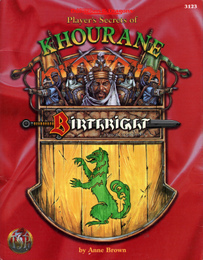 This Birthright domain sourcebook is designed for players who wish to take the role of the Emir of Khourane. It may also be used by players seeking to play nobles, servants of the regent, or adventurers from Khourane." "Before the humans descended on Cerilia, the continent was virtually untouched, inhabited only by those who understood how to live in harmony with nature. Since the human incursion, however, the natives have been forced to realign themselves with their homelands and their neighbors. No group has felt the effects of these maneuverings as much as the elves, who now engage in a daily struggle to keep a hold on their lands, fight off human interests, and preserve their heritage. In Tuarhievel, matters have recently gotten worse. Prince Fhileraene has disappeared after being coereced into answering a summons from the Gorgon - but before he went away, he transferred his bloodline to his consort, a human female named Savane Mhoried. Many of the elves of Tuarhievel consider this act to have been a betrayal of their heritage, even though the interim regent has promised to pass the bloodline to her yet unborn child as soon as that child comes of age. But in the meantime, the elven nation is in upheaval. The land needs a strong leader to prevent traditional values from clashing with the needs of the nation, lest it be torn apart. Can your character walk the fine line between tradition and neccessity to unify Tuarhievel? 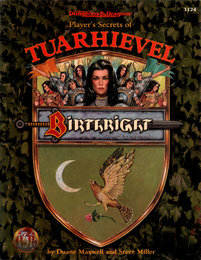 This Birthright domain sourcebook is designed for players who wish to take part in the rulership of Tuarhievel, either as the regent or as the leader of one of the domain's noble families. This information is invaluable to anyone who might wish to approach Tuarhievel as a political ally or embark on adventures in the area." "Stjordvik is a domain teetering on the brink of economic collapse, but rich in resources that could inject fresh life into the royal treasury. The land is politically fragmented by provincial jarls who go their own way rather than heed their king, but at the same time populated by freemen who disdain those petty power-seekers. For centuries the Great Oak Wall along the northern and western borders of Stjordvik has kept the orogs of the Blood Skull Barony and the barbarians of Rjuvik at bay, but now the barrier is near collapse in many places - and if it goes down, so does Stjordvik. As the new ruler of this old and proud kingdom of warriors, it is your job to suppress the other jarls and unite the provinces; to build up the army and the treasury by drawing upon the support of the freemen; and to shore up the weak spots in the Great Oak Wall before a horde of invaders can destroy everything you have worked for. Your fate and the fate of Stjordvik are intertwined - what will that fate be? 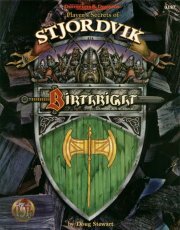 This Birthright sourcebook, the second product covering one of the domains in the Rjurik Highlands, is desgined for players who want to take the role of the King of Stjordvik. It may also be used by players portraying nobles, vassals of the regent, freemen, or adventurers from this domain." 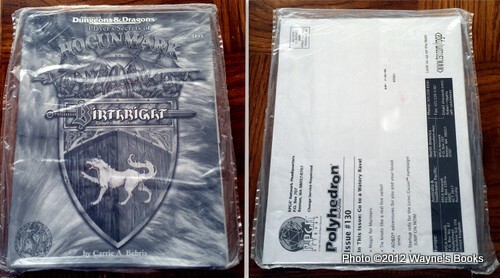 The last published product in the Birthright line, Hogunmark was released only to RPGA Network members, bundled with Polyhedron Magazine, issue 130. A pdf (with the color cover) was available via the Wizards of the Coast website for a while. 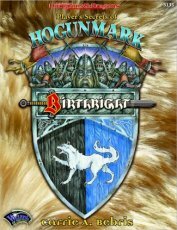 "The Hogunmark domain sourcebook details the people, land, customs, and culture of Hogunmark, a Rjurik domain on Cerilia's northern frontier. Queen Freila, the ruler described in The Rjurik Highlands accessory, has died, leaving the domain without a clear successor. This book assumes your player character (PC) is one of her six landed Jarls (though you can play a different type of character if you choose). Your PC has the strongest claim to the thone but still must prove worthy of it. Players of nonregent characters who live in or come from Hogunmark will also find this domain sourcebook useful. The independent streak known to Hogunmark's people makes this domain an ideal home for any adventurer." "Some regents would find the conditions in Muden a bit to their disliking -- sharing the rule can be uncomfortable. Depending on the motivations of the regent, and on what he wants to achieve for himself and the realm, he can use Grabentod’s sentiments to his benefit. Since the pirates have tried to assassinate Melisande Reaversbane more than once, chances are good that they will try again. A count seeking to eliminate his co-regent can make sure that, this time, a back door is left open for the assassins. With the captain dead, the count becomes the sole regent in control of Muden (for a while, anyway). Her horrible murder would be avenged, of course. The Royal Fleet would not sleep until the whole of the Grabentod navy rested under the waves and its current leader was hauled to court in chains -- possibly even for usurpation of birthright and regency. The count then could set up in Grabentod a puppet government that would pay vassalage to Muden, guaranteeing the sale of lumber cheaper than the market value. This tactic would help save the some of the precious forestland in Muden. Of course, it would be dangerous to underestimate the captain’s appeal among the citizens. Only the most popular of regents could weather the resultant outcry and unrest within the bayshore provinces following her foul assassination—and woe to the regent who finds himself rightly implicated in her murder! In addition, if Muden’s ruler proves himself a less than able naval commander, the officers of the Royal Fleet could easily prevent him from seizing the law holdings left open with Melisande’s passing. But most importantly, assassinating a lieutenant of such fine character as Captain Reaversbane is quite a bit less than a noble act—certainly beneath someone claiming to be a hero. An alignment change might be called for, should the hero attempt such a foul deed." Never published; available in PDF. Wizards of the Coast owns (and holds trademark to) the AD&D game and Birthright in all forms.